This feature allows you to expand on your child further than the 250 character description. Within your detailed story, you have the ability to add text, videos, or pictures on your sponsored child! Follow the steps below in order to add an about me section on your sponsored child. 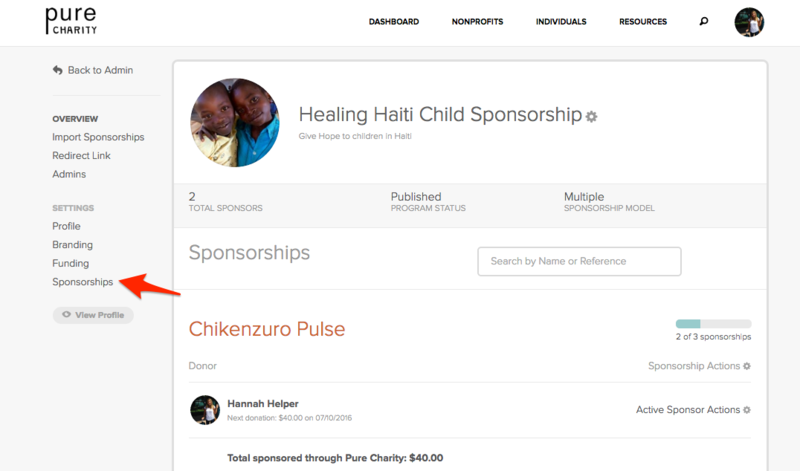 STEP ONE: Starting from your nonprofit dashboard, select Sponsorship. Next click the correct Sponsorship Program. STEP TWO: Select Sponsorships in the menu on the left. STEP THREE: Next, select "edit" on your specific child. STEP FOUR: Scroll to the bottom of the page to fill out a detailed story on your child. Click Save Sponsorship. If you have any questions, please contact your account lead or help@purecharity.com. How do I download a sponsorship CSV? How To: Manage My Trip's Payment Guarantees?